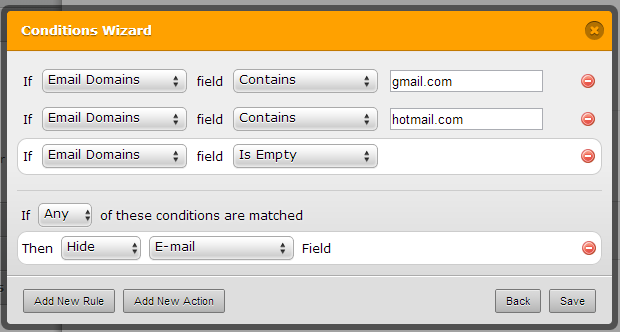 Is there an option to exclude specific email domain names like gmail, hotmail, etc from the email field of a form? You can use -Conditional-Logic-on-Forms . In the textbox field, set the rules "Contains". You can test this form http://www.jotformpro.com/form/30153150883953 . Please inform us if this does not work for you. Btw your Support is missing an option to let a guest be informed of an answer to its request. I had to keep the page open in my browser and refresh it. It could be because you were not logged in earlier when you created the topic? To be a guest user only, it is possible that the email box was not filled-in when the topic was responded to or created.